Updated fuzz unit offer “David Gilmour-like” tones. 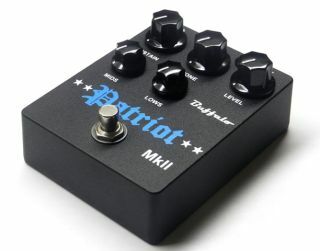 French pedal maker Buffalo FX has introduced the Patriot Mk II, an update to its original Patriot muff circuit. The Patriot is based on the Civil War Muff circuit, with Buffalo promising David Gilmour-like tones circa Pink Floyd’s 1994 The Division Bell tour. The new iteration offers the full range of tones of the original Patriot, with additional low-end cut and midrange boost. Controls include Sustain, Level, Tone, Mids and Lows. There are also top-mount power and signal jacks, as well as true bypass switching, Russian NOS clipping diodes and a low-current dimmable LED. For more information, head over to Buffalo-FX.com.